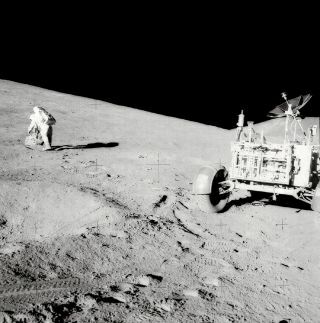 Astronaut David R. Scott explores the slope of Hadley Delta on the Moon. In this historical photo from the U.S. space agency, Astronaut David R. Scott, mission commander, with tongs and gnomon in hand, studies a boulder on the slope of Hadley Delta during the Apollo 15 lunar surface extravehicular activity on August 1, 1971. The Lunar Roving Vehicle (LRV) or Rover is in right foreground. View is looking slightly south of west. "Bennett Hill" is at extreme right. Astronaut James B. Irwin, lunar module pilot, took this photograph.